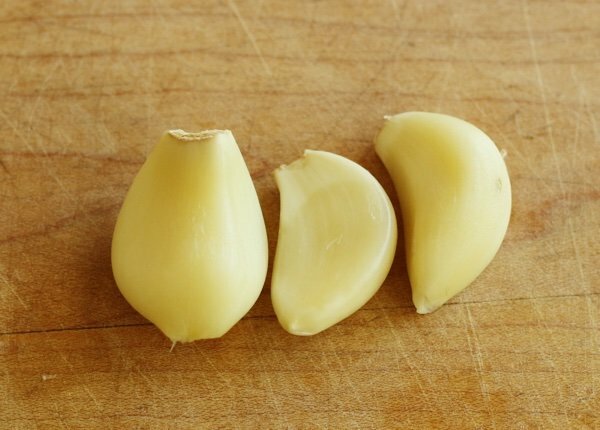 Do you know how to peel garlic quickly or do you avoid fresh garlic so you don’t have to peel it at all? I used to buy jars of pre-chopped garlic because I hate peeling garlic. It feels like it takes years when I am hustling to get dinner done. 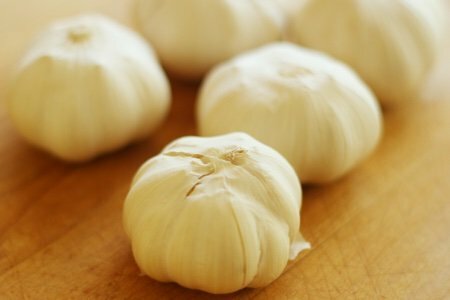 I use a lot of garlic in my recipes so the problem is not trivial. My Chinese honey garlic chicken recipe calls for three cloves of garlic and my vegetarian black bean soup recipe includes six cloves of garlic!! I learned a method years ago from an Italian chef. She laughed when she saw me slowly attempt to peel the papery skin off. She taught me the use the flat side of the knife method. You break apart the cloves and then press down with the heel of your hand on the flat part of the knife on the clove. The pressure downward causes the garlic clove to break open. The clove ends up smashed but it will pop right out of the peel. This has been my go to method for about 28 years. I smash and then pull off the peel. But, an old dog CAN learn new tricks because I recently came across the microwave method and I am sold. 1. The garlic almost falls out the peel. 2. The garlic mellows and loses its bite. Do you fear raw garlic? Well, you don’t have to! Try making my hummus recipe without tahini with the perfect almost soothing garlic. I was so excited that I made a little video (no ads) to show you how fast this is. I peeled three garlic cloves in 16 seconds. Instead of smashed cloves – you have perfect cloves ready for anything and much less sharp tasting. So, stop buying pre-chopped garlic and start using the fresh stuff. 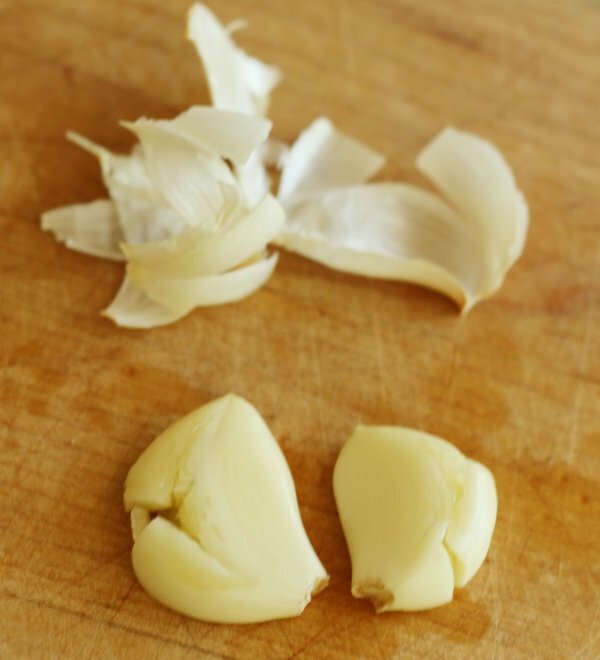 The flavor of fresh garlic is much better and you have 16 seconds to peel garlic. Yes, you do! How do you peel garlic? I do the knife method. I love the taste of garlic. The more garlic the better! I wouldn't want it to lose its bite. lol! The only problem with microwave is that it kills all nutrition in all foods, very unhealthy to use this time saver! Thanks Angela. 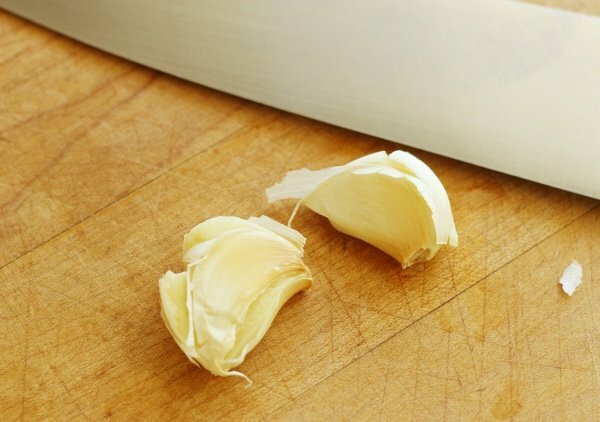 I, too, hate peeling garlic and have used the smashing trick for years. I like this method better! Accredited universities (like Harvard), registered professionals sites (American Dietetic Association, Dietitians of Canada), accrediated hospitals and health centres (like the Mayo Clinic) and government sites are the best for reliable, credible, accurate health (including nutrition) and medical info. Also check for the HON code (Health On the Net) at the bottom of the website. I've used this method for a number of years. I find with my 1100-watt microwave that 7 seconds is sufficient for most cloves; 12 seconds for two cloves. Another trick: hold a piece of stainless steel under running water to get the garlic smell off of your hand. I (carefully) hold on to the blade of my chef's knife while rinsing it off after chopping the garlic. Mason jar method by far the best. There's another easy way I saw on Sara Moulton ...break up clove, put in pan, put on lid and shake vigorously. The paper sleeves come off and you can use or freeze cloves. I already have the built-in habit of using the ''knife-method'' and find it easy and fast. I do remember my early years of trying to peel garlic so all this info is very helpful for new cooks. It's fun to learn new ways. I've tried rolling whole bulbs inside empty toilet paper tubes too, what a hoot.